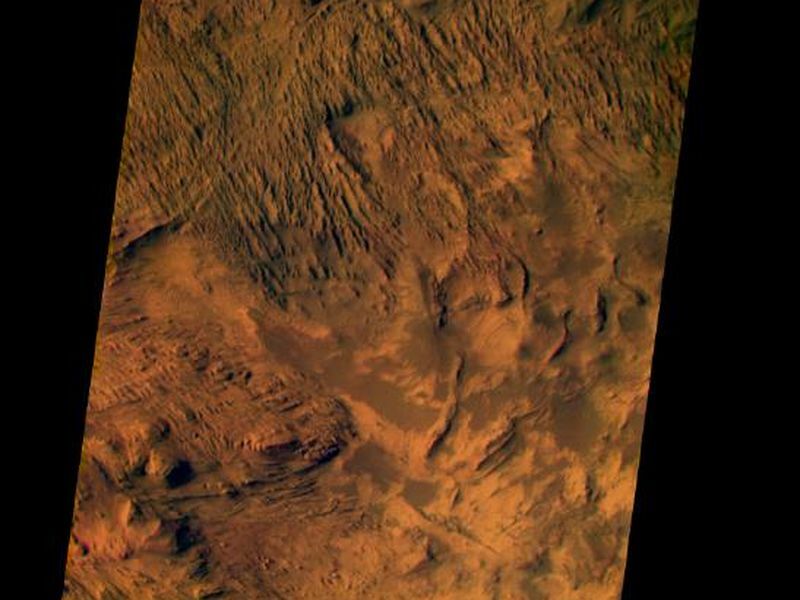 This image from the camera system on NASA.s Mars Odyssey was acquired of Candor Chasma within Valles Marineris, centered near 5 degrees south latitude, 283 degrees west longitude. 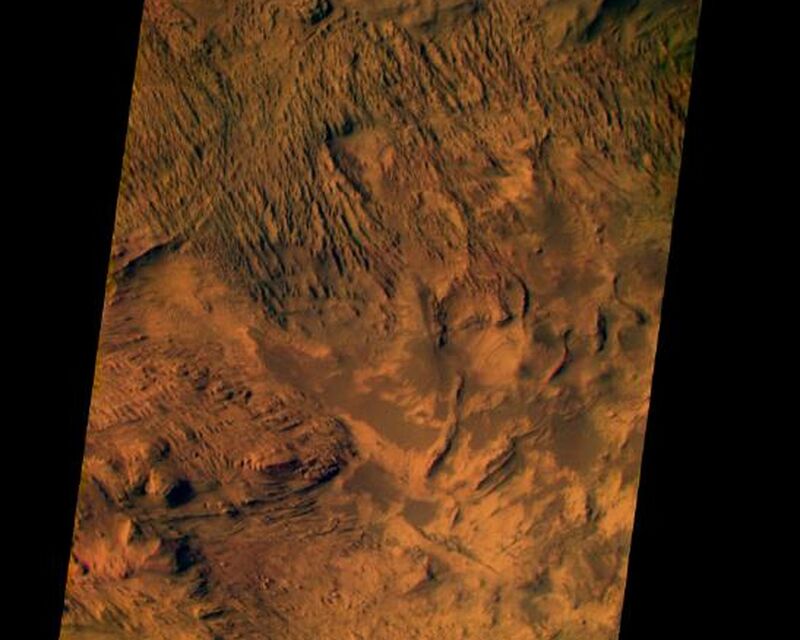 This visible color image shows the effects of erosion on a sequence of dramatically layered rocks. These layers were initially deposited within Candor Chasma and have subsequently been eroded by a variety of processes, including wind and down-slope motion due to gravity. 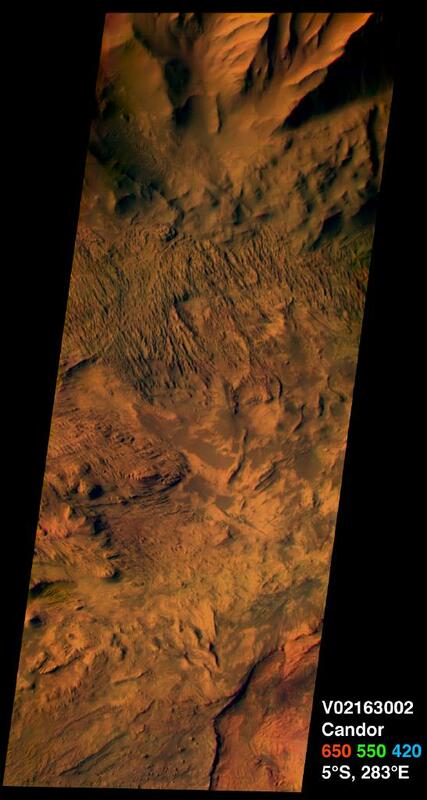 Relatively dark materials appear to mantle some areas of the layered deposits; these dark materials are likely sand. Few impact craters of any size can be seen in this image, indicating that the erosion and transport of material is occurring at a relatively rapid rate, so that any craters that form are rapidly buried or eroded. This image was acquired using the thermal infrared imaging system.s visible bands 1 (centered at 420nanometers), 2 (centered at 550 nanometers), and 3 (centered at 650nanometers), and covers an area approximately 19 kilometers (12 miles) in width by 50 kilometers (50 miles) in length. 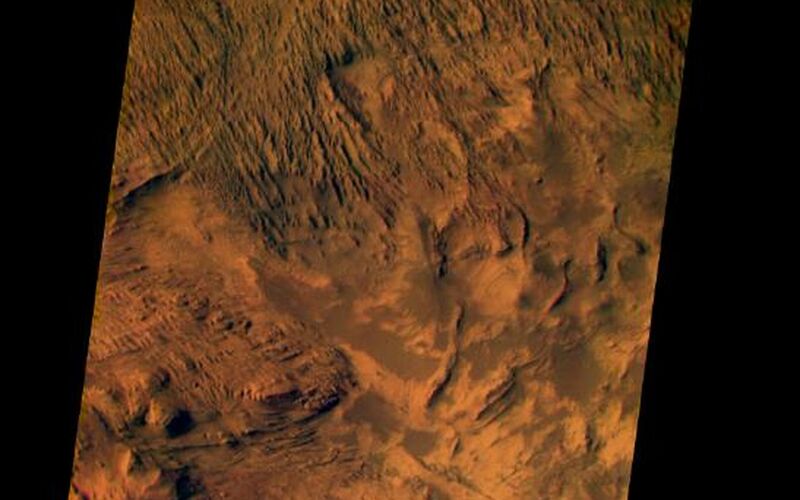 The Jet Propulsion Laboratory, a division of the California Institute of Technology in Pasadena, manages the 2001 Mars Odyssey mission for NASA's Office of Space Science in Washington, D.C. Investigators at Arizona State University in Tempe, the University of Arizona in Tucson and NASA's Johnson Space Center, Houston, operate the science instruments. Additional science partners are located at the Russian Aviation and Space Agency and at Los Alamos National Laboratories, New Mexico. Lockheed Martin Astronautics, Denver, is the prime contractor for the project, and developed and built the orbiter. Mission operations are conducted jointly from Lockheed Martin and from JPL.